Refugees who were on hunger strike for 14 days to demand a faster family reunification process in Germany, hold a banner as they demonstrate in Athens. 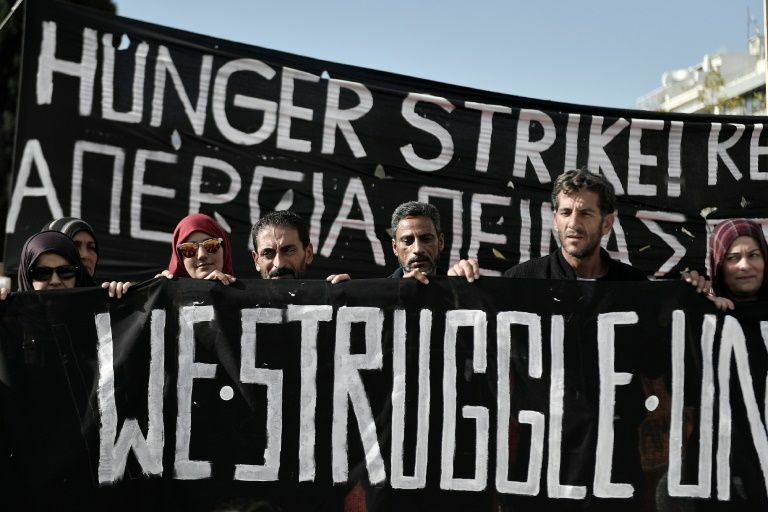 Fourteen Syrian refugees, who staged a hunger strike in Athens, Greece over the plight of families waiting to be reunited in Germany, ended their two-week protest on Tuesday. The German consul and an official from the Greek migration ministry gave the demonstrators assurances, protest organiser Yiorgos Maniatis said at a press conference. The Berlin official gave a guarantee they would be accepted in Germany once the six-month maximum delay between a request and transfer — set by European rules — was exceeded. Three of the refugees have since received the green light to travel to Germany. The protesters, seven women and seven men, came out of the tents they had pitched in front of the Greek Parliament at midday. However, as well as demanding the acceleration of their own cases, they also called for the six-month waiting limit for Syrian refugees to be respected following reports of a deliberate slow-down. In total, the deadline has been exceeded for around 2,500 refugees stranded in Greece, according to Mr. Maniatis. “Our request was accepted eight months ago, but nothing has moved,” one of the refugees, Zamila, told AFP. Having arrived in Greece nearly two years ago, Zamila is waiting with her husband and her 16-year-old son to join her four other children, aged 15 to 24, who have been living in Kiel in northern Germany, since October 2015. The Greek press reported in May that Athens and Berlin had reached an informal agreement to slow down the transfers ahead of the elections in Germany to around 80 per month. Greek and German officials blamed the delays on bureaucratic difficulties and the pace picked up, with more than 350 departures in November, Mr. Maniatis said. According to the U.N. High Commissioner for Refugees, Greece has registered some 9,300 applications for reunification this year, and 5,000 have been approved so far. At the launch of the protest, the Athens municipality, held by the centre-left opposition, blamed the government for creating the problem by resorting to a “hidden bilateral agreement” with Germany.